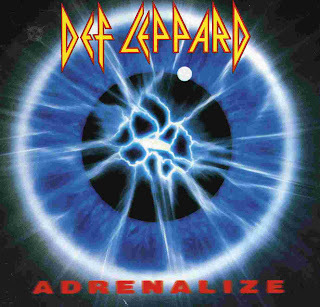 Released four and half years after the stunning commercial success of Hysteria, Adrenalize is helplessly stuck in the wrong decade. Between 1987 and 1992, heavy metal's commercial appeal peaked with Metallica's black album, and a certain band called Nirvana released Nevermind. The music terrain shifted noticeably away from pop rock and metal lite, but not that Def Leppard would have noticed. Occupied with the alcoholic disintegration and death of guitarist Steve Clark, when the band finally recorded and released Adrenalize, it sounded like warmed over slop from another era. It's not that Def Leppard are doing anything differently than what brought them success on Hysteria and before it Pyromania, but that is precisely the problem. Adrenalize offers nothing that is remotely new, just rehashing of the same melodies, harmonies and lavishly layered production values. It's the exact same puzzle pieces reassembled into a profoundly more mundane picture. Perhaps suffering more than expected without the guiding hand of producer John "Mutt" Lange, here it all sounds forced, manufactured, cold and lacking in integrity, an almost perfect example of going through the motions, one more time, in the wrong year. Lyrically the entire content is occupied by limp love, juvenile lust and misguided cockiness. Coming from a mature superstar band five albums into the catalogue, it's all quite embarrassing. Filled with boring ballads, and worse, boring rockers, Adrenalize sadly just atrophies. Produced by Mike Shipley and Def Leppard. Engineered and Mixed by Mike Shipley.